Somewhere I read a line that really stuck with me. It described brewing a lot of different types of beers as a “series of one night stands.” It was meant to convey that the results might be satisfying, but you were only skimming the surface of your possible skill set because there was no baseline from which to grow. Okay, it was a metaphor that was meant to shock a little bit and I am sure the writer was not trying for a bit social commentary. The idea, however, is solid. To get the most out of your talents as a brewer and to make the best beer possible you need to focus on creating a single so-called house recipe. With my keezer finished and pouring pint after pint, as well as the occasional growler, it seemed like a perfect time to start devising a house recipe of my own. 1 oz. Citra pellet hops, dry hopped after one week of primary fermentation. Primary fermentation was for 2 weeks, with the dry hopping one week in, and the beer was keg conditioned for 2 weeks prior to hooking it up to the keezer. I put this beer into the keezer under pressure and waited a few days to serve. The first few glasses were…um…disappointing. The dry hopped Citra notes were overpowering and there was not enough body in the beer to hold up the flavors. iBrewMaster calculated the batch to have 4.6% ABV and 36 IBU. A few days later the pints went down better, as if the beer had mellowed somewhat in the keezer. Subsequent pours in the following weeks have confirmed that this was a beer that needed some additional time to have the flavor profile blend and mellow somewhat. Oh well, my desire to drink my homebrew got the best of me. 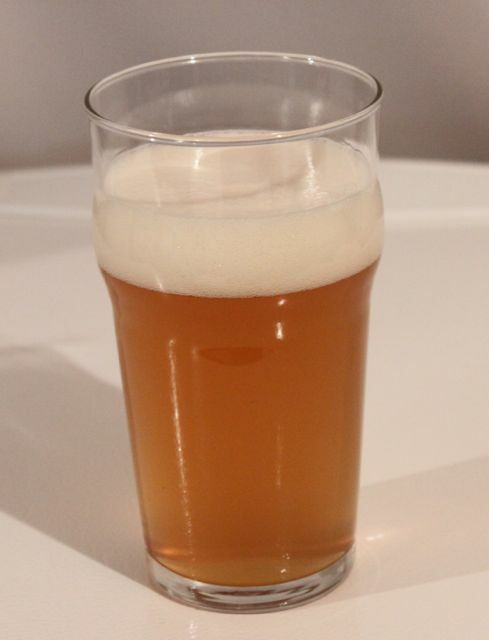 Overall, a minor failure for my firs go at a house pale ale recipe. The biggest change I am going to make in recipes going forward is to reincorporate some specialty grains steeped prior to the boil. I believe that this will add some needed complexity and body to the base of the beer so that it can handle bolder hop profiles. We shall see.